Since 1992, MITRE's Nanosystems Group has been performing broad-based research and development (R&D) in nanotechnology. A unique strength of the group's technical efforts is its focus on systems engineering at the molecular scale. The group's innovations in nanotechnology include key technical papers, inventions, and patents. The group also assists the U.S. Government in a wide range of activities including working with government officials in planning major nanotechnology R&D programs. A key element of the MITRE Nanosystems Group is the participation by exceptionally talented high school, undergraduate, and graduate students. These student employees collaborate closely with senior staff; their joint efforts have contributed materially to the success of U.S. efforts in nanotechnology. This student mentorship program continues to contribute toward the education of the next-generation of highly skilled scientists and engineers in the U.S. The principal objective of the Nanosystems Group's nanoelectronics R&D is the design and demonstration of functional nanocomputers - electronic computers composed of molecular-scale devices and integrated on the molecular scale. Such nanocomputers will be much tinier and denser than their conventional counterparts, as well as more tightly embedded into the complex electronics systems that MITRE's sponsors require. They also will enable unimaginably diverse applications in the wider world. For over 15 years, the Nanosystems Group has carried out systematic R&D in the design and simulation of devices, circuits, and architectures for nanoelectronic systems, including nanocomputers. Since 2006, commencing with the opening of nano/biotechnology laboratory facilities at MITRE, we have conducted a parallel effort in the experimental characterization and testing of nanoelectronic circuit and system prototypes. MITRE's Nanosystems Group conducts a broadly-based research and development effort in the area of nano-enabled energy storage and power systems. These efforts include both reviews and analysis of the state-of-the-art in nano-enabled power and energy devices, as well as physical experimentation in MITRE's Nanotechnology-Biotechnology Laboratory. The motivation for these investigations is that conventional energy storage and power system technology has imposed a severe burden on the "SWaP" (Size, Weight, and Power) budgets of portable electronic systems. This problem has been exacerbated in recent years as the field of electronics has continued its exponential increase in capability and attendant power consumption, while portable energy sources have seen only modest improvement. 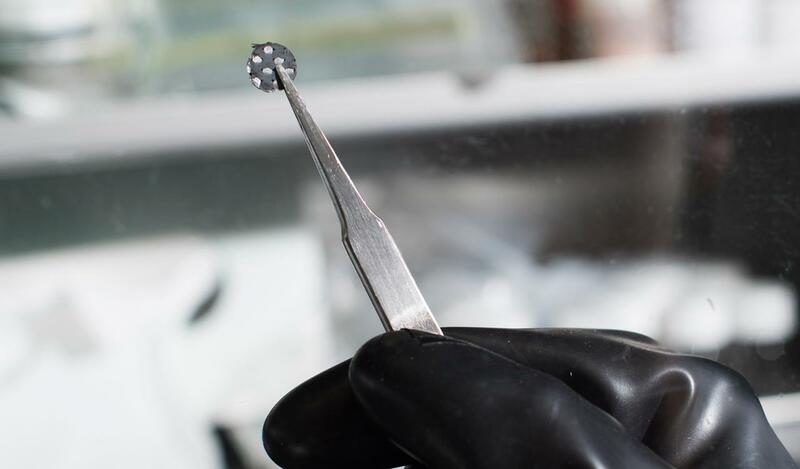 However, recent advances in nanotechnology-enabled devices show much promise to dramatically reduce the size while increasing the energy and power densities of portable energy systems. Such improvements would assist greatly, and possibly solve the SWaP challenges associated with a number of critical applications. Review and analysis of state-of-the-art nano-enabled energy storage and power systems. Research and development of hybrid energy storage and power prototypes that combine the high energy densities of (nano-enabled) batteries with the high power densities of (super)capacitors. Independent verification and validation of the performance of nano-enabled energy storage and power systems developed for our government sponsors. The Nanosystems Group's nanosensor R&D efforts focus on developing nano-enabled sensors for chemical and biological detection. We conduct reviews and evaluations of the state-of-art in sensor systems, as well as experimental work at MITRE's laboratory facilities. Our R&D activities include innovative nano-enabled sensing, sensor prototyping and integration, and system performance testing and evaluation. Nano-enabled sensors are sensory systems that employ elements at the nanometer scale to convey information about the occurrence of a chemical, biological, or physical event. For chemical and biological detection, the most important advantages of nano-enabled sensors are they make possible much smaller devices and have high sensitivity because they can recognize agents at the molecular level. One example in the natural world is sensitive biological noses, such as a dog's, that can sense minute amounts of nano-sized molecules. This suggests that nano-enabled sensors can be developed for nose-like sensing to detect trace volatile chemicals and airborne biological agents. Another potential application for such devices is deciphering the nanostructure of biomolecules like DNA sequences. MITRE’s Nanosystems Group is pioneering research and development into nanoforensics. Nanoforensics is an emerging technology that combines advances in nanotechnology, microfabricaton, metrology, and materials science to realize nano-enabled materials and nanotechnology-based methods that may be used for criminal investigation as well as verification and monitoring applications. These applications include improved measurement and analysis techniques, chain-of-custody monitoring and control, tamper indication, advanced forensic methods, quality assurance, quality control, and advanced taggants. There are a number of factors driving the development of nanoforensics. Technology drivers include advances in microfabrication, nanofabrication, materials processing, metrology, and analysis to realize new detection methods as well as nano-enabled systems with complex integrated functionality. The forensic science community is also driving development of nanoforensics due to the need to improve evidence handling methods and laboratory best practices. There also are significant industrial and commercial factors driving the development of nanoforensics. Counterfeiting, for example, is a costly and dangerous problem and is rampant in industrial, medical, and consumer goods. Further, in today’s complex globalized manufacturing environments there is a need to develop improved methods for quality assurance and quality control. Nanoforensics can help address these problems. MITRE's Nanosystems Group conducts research on monolayer films coated on one side with nanoscale carbohydrates that can be used to capture human pathogens from the environment. This effort includes both laboratory experiments and reviews of scientific studies that define the specific carbohydrate structures on human tissues to which pathogen proteins bind in order to establish an infection. To support this research, MITRE built the SugarBind database, now hosted by the Swiss Institute of Bioinformatics. The initial motivation for this research was the expense of monitoring surface water for the presence of human pathogens. MITRE’s monolayer films, produced from natural glycoproteins and oils, are inexpensive and environmentally safe scaffolds supporting clusters of carbohydrate receptors that bind to human pathogens and facilitate their removal from the environment. MITRE holds four patents on this technology and has refined methods of producing spherical, micrometer-scale bubbles or micelles of glycoprotein film that capture human pathogens and biotoxins and lift them to the surface of fluids where they can be collected for further examination. Our goal is to produce micelles and other film-coated tools that can be used to remove human pathogens from contaminated fluids and surfaces, including human tissue. The MITRE Nanosystems Group has long been interested in small robotic systems as platforms for integrating the latest advances in nanotechnology-enabled electronics, sensors, and power storage devices. Until 2005, our robotics R&D efforts focused on "ant-sized" robots, each only three to five millimeters in length, constructed using the same processes used to fabricate computer chips and other semiconductor devices. The design, fabrication, and characterization of several generations of prototype components led to the conclusion that the technologies and applications for such miniscule systems required further maturity and significant R&D investments before they could become relevant to our customers' missions and interests. This realization led us to shift our R&D efforts to systems that, while significantly larger in size at ~60 millimeters, could still benefit substantially from advances in technology miniaturization such as those enabled by nanotechnology. Beginning in 2008, we thus began taking steps to build what are now known as the MITRE millirobots. The first-generation millirobots were relatively unsophisticated systems that exhibited simple obstacle avoidance behaviors and demonstrated that dense integration of commercial-off-the-shelf components could produce a robotic platform with enough battery life and mobility to accomplish meaningful tasks. These initial prototypes then were further improved when we introduced digital wireless networking, an on-board camera and microphone, and more sophisticated control techniques. The mechanical robustness, reliability, and modularity of the millirobots also were improved. The ultimate goal of this R&D effort is to demonstrate "sensor-agnostic" robotic platforms that can serve as delivery or mobility platforms for arbitrary sensor payloads. These "plug-and-play" systems could be easily and quickly customized at the time of use to deliver payloads to places that humans cannot or should not go, and could find applications search and rescue, surveillance, and mobile sensor networks. A fundamental challenge in the field of nanotechnology is to model and design bulk properties of matter accurately from the "bottom up" - that is, based on the quantum properties and the arrangement of trillions upon trillions of individual component atoms and molecules. This capability would enable rapid, economical design of materials with pre-specified unique properties, using much less of the expensive physical experimentation that presently is required. This challenge, however, is quite formidable, as it implicitly involves multi-scale materials modeling—i.e., modeling matter on multiple length scales that range over 10 to 12 orders of magnitude. Rapid, seamless modeling on all these scales is made particularly difficult because the quantum laws of physics that prevail on the smallest, atomic and molecular scales are seen to differ from the classical laws that govern matter on macroscopic scales. Over the past several years, however, research in the MITRE Nanosystems Group has yielded new insights into the electronic properties of materials across multiple scales. These investigations revealed new regularities or laws of physics that govern the ability of matter to hold charge on all scales. These laws are expressed by the same, simple linear equations from the pico-scale to the macro-scale. These scale-invariant linear relations governing charges in matter are particularly significant for multi-scale modeling because it is charge that holds matter together on all these scales and dictates all its properties. The unique effort going forward involves learning how to extend and apply these new, multi-scale laws of physics to the modeling of matter on all scales.